WPS Office allows you to change the default English (US) spell check to a different language. Currently the software supports 11 languages, which include English (United States/United Kingdom/Australia), Spanish (Spain/Mexico), French, Dutch, Polish, Portuguese (Brazil), and Russian. You can also add new dictionaries to WPS. Take the following steps to switch between different languages for spell check. Step 1. Open an existing document with WPS Writer. Step 2. In the Classic interface, go to Tools > Set Language. Step 3. 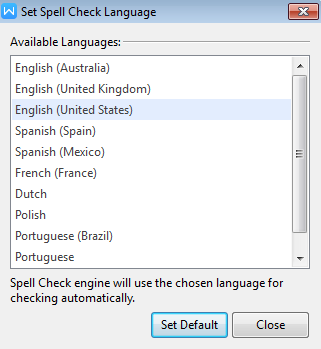 In the Set Language dialog, choose a default language for spell check and press Set as default. The default dictionary is changed to Polish. You will find that Writer automatically checks spelling according to your new choice of language.